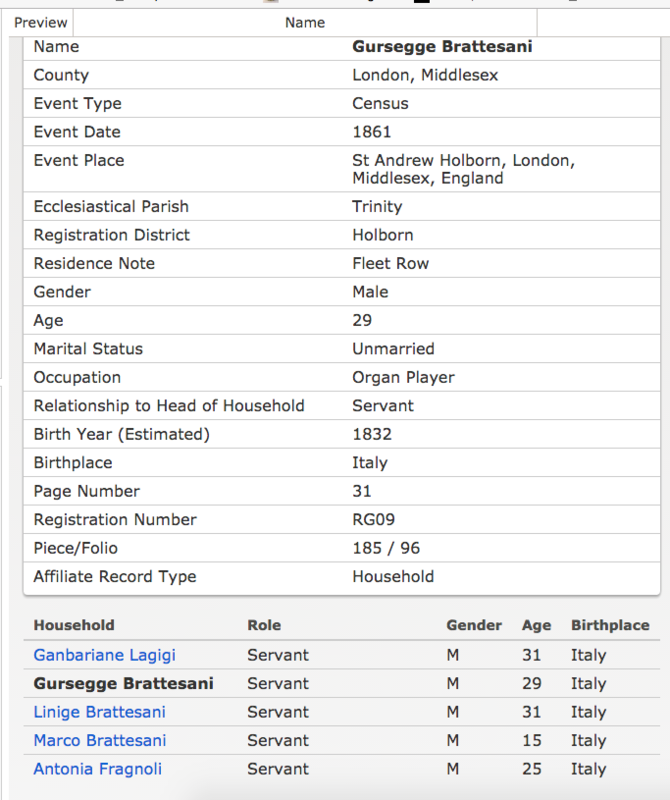 Giuseppe Brattesani was one of the very first of the Brattesani family to arrive in the U.K. He came in through the Port of Dover in the year 1834 with a band of travelling musicians with surnames that are familiar to us. Not unusual as they were intertwined from back home in the villages of Parma. So well before the Unification of Italy, when we believed the family left Italy, do we find this band of Italians were moving from their homeland to try and establish themselves abroad. Travelling with Giuseppe Brattesani are Giovanmaria Cardinale and Giolomo Zanrae. The Cardinale family and Zanrae are both from The Borgotora region of Parma and have many branches connected with our own. The Napoleonic wars left Northern Italy with a destroyed agriculture and consequently many farmers were forced to emigrate: a few thousand moved to the British isles in the first half of the nineteenth century. 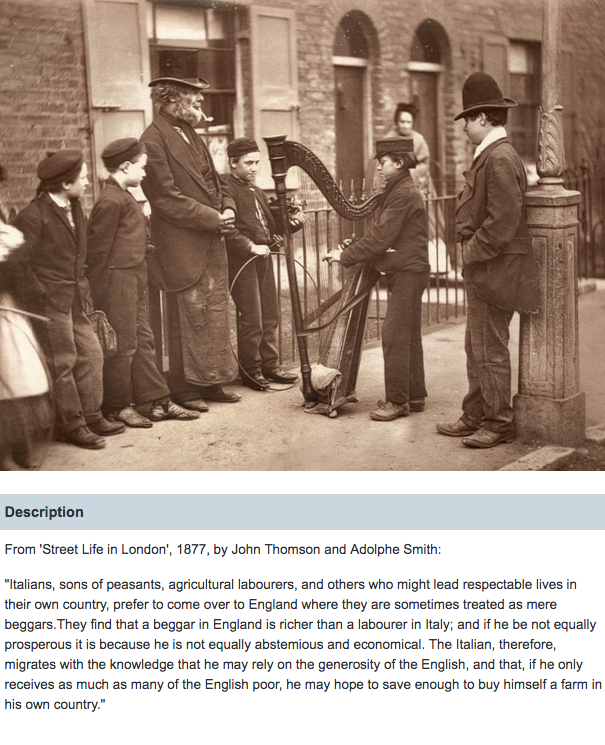 From the 1820s to 1851 there were over 4000 Italian immigrants in England, with 50% of them living in London. The regional origins of most were from the valleys around Como, and Lucca. The people from Como were skilled artisans, making barometers and other precision instruments. People from Lucca specialized in plaster figure making. By the 1870s the regional origins of Italian emigration to England and Scotland were the valleys of Parma in the North of Italy and the Liri valley, half way between Rome and Naples. A railway network had been started in Italy by this time and this helped the people from the Liri valley to migrate to the North of Italy, and then on to Britain. The people from Parma were predominantly organ grinders, while the Neapolitans from the Liri valley (now under Lazio) made ice cream .the occupational structure of the immigrants, up to the 1870s, remained “substantially the same.” After this date all itinerant employment crossed regional demarcations. The centre of the Italian community in Britain throughout the 19th Century, and indeed to the present day, is ‘Little Italy’ situated in a part of London called Clerkenwell. A good description of its existence can be found from an 1854 print, is of a “warren of streets around Hatton Garden.” Dickens’ Oliver Twist and Gustave Dore’s prints of London at that time fill in the images. As numbers increased and competition grew fiercer, so Italians spread to the north of England, Wales and Scotland. They were never in great numbers in the Northern cities of England. For example, the Italian Consul General in Liverpool, in 1891, is quoted as saying that the majority of the 80-100 Italians in the city were organ grinders and street sellers of ice-cream and plaster statues. And that the 500-600 Italians in Manchester included mostly Terrazzo specialists, plasterers and modellers working on the prestigious, new town hall. While in Sheffield 100-150 Italians made cutlery…..of the 1000 or so Italians in Wales at the end of the 19th century a third of them worked as seamen on British ships, a third worked in jobs that serviced shipping, such as ships chandlers, seamen’s lodgings etc., and most of the rest worked in the coal mines. 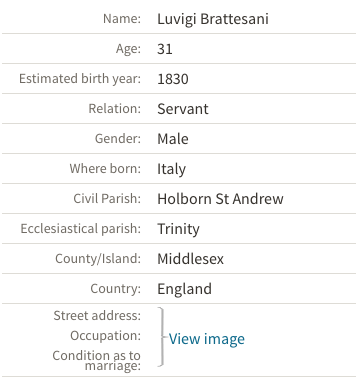 1861 – Another Giuseppe Brattesani, age 29 – this time in Middlesex, London, still with the occupation of Musician . No proof but must assume that this Giuseppe with brothers Luigi and Marco are descended from Giuseppe 1810. These Brattesani brothers were all born in Italy – so perhaps they came later with other branches of the family. Giuseppe went on to Marry a girl maiden name Fanny…… They lived at 31/2 Lunham’s Buildings, Kingston Upon Hull. We know that he died prematurely in 1907. In the 1901 English Census they have no children listed. Joe Brattesani with brothers Luigi and Marco. Luigi was born 1831, Marco born 1846 and there was also Francesco who was born in 1833 who is not shown at this address at that time. In the early 1800s the Italians who arrived in London were affluent, skilled craftsmen who manufactured thermometers, telescopes and optical instruments. Following the Napoleonic Wars more Italian migrants arrived driven by terrible economic conditions. Most were poor and unskilled and travelled to London on foot. Organ grinding and knife grinding were common trades, as was making plaster statuettes with many of the craftsmen coming from Lucca in Tuscany. Ice-cream selling soon took off and as the men brought their spouses over to join them more Italian restaurants and cafes opened. The women also became domestic servants and got involved in lace manufacture. Others chose street entertainment and made money singing and dancing or telling fortunes by means of parakeets in cages. The area known as Little Italy covered north and south of Clerkenwell Road. Rosebery Avenue and Farringdon Road were the boundaries in the north and the south took in the streets and alleyways around Saffron Hill, Leather Lane and parts of Hatton Garden. Leather Lane has had a market for 300 years but when the Italians arrived in the nineteenth century it was run down. By 1850 there were over 1,000 Italians in Clerkenwell living in densely-populated, slum-ridden streets. The area was made famous by Charles Dickens in “Oliver Twist” as The Artful Dodger took Oliver there to meet Fagan who had rooms on Saffron Hill. By the 1880s the Ice-Cream Man or ‘okey-Pokey Man was a common sight and usually came from Saffron Hill. The colloquial name came from his cry of Ecco un poco! meaning ‘Here’s a little (taste)’. 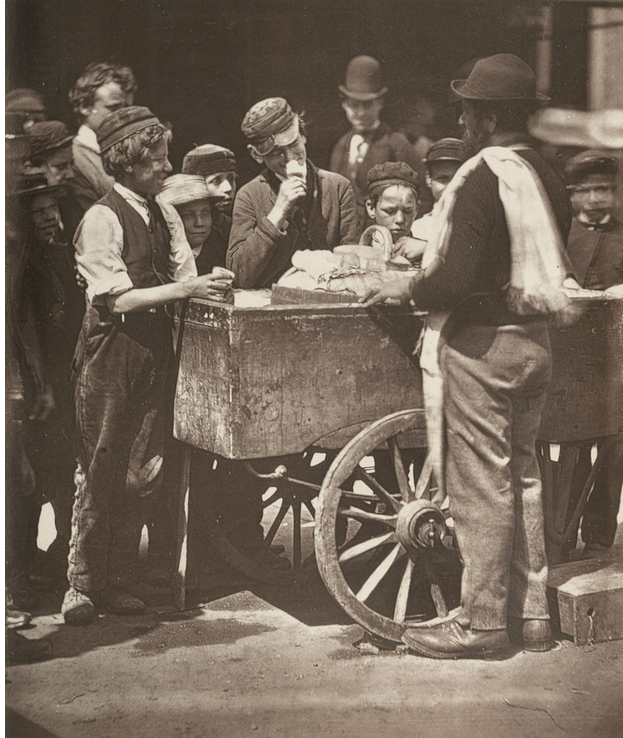 Itinerant trades continued to be popular and by the 1890s there were 900 ice-cream sellers in the area. The Italian consul published a report in 1895 estimating there were 12,000 Italians in London with southern Italians traditionally making their home in Little Italy while those from farther north were establishing a newer base in Soho. 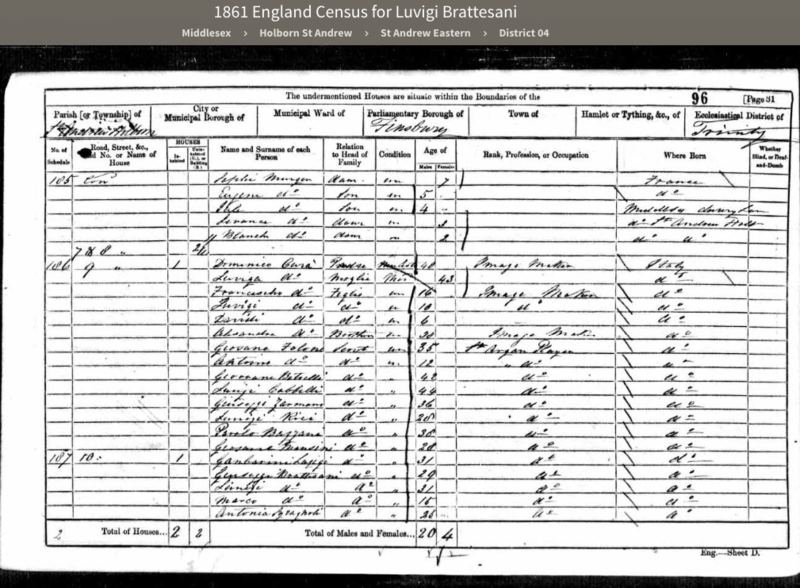 1871 Francesco Brattesani in 1871 living at 46 Spencer Street, Myton, in Yorkshire with his wife Madalene, who was born at sea and their son Frederick who was born in Hull please note the spelling of the name as Brattezani. Working in the Docks. Frederick has been married for 16 years and is working for a Railway company in Hull in Yorkshire.